The ground and cargo handling services market to reach values of over $32 billion by 2023, growing at a CAGR of approximately 6% during 2017-2023. CHICAGO, IL, UNITED STATES, September 11, 2018 /EINPresswire.com/ — Arizton’s recent market research report on the ground and cargo handling services market identifies Swissport International, Dnata, Menzies Aviation, and Worldwide Flight Services (WFS) as the leading vendors that are likely to dominate the market during the forecast period. This research report provides a detailed analysis of market segmentation by service type (ground handling and cargo handling), by airplane type (passenger airlines, cargo airlines, and chartered airlines), and geography (APAC, Europe, North America, Latin America, and MEA). 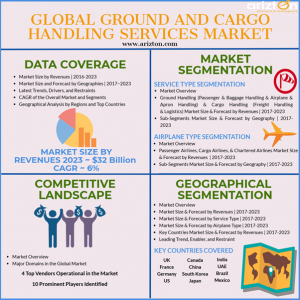 The ground and cargo handling services market is anticipated to reach values of over $32 billion by 2023, growing at a CAGR of approximately 6% during 2017-2023. The cargo handling services market is divided into three major segments that consist of service type, airplane type, and geography. The cargo handling services market by geography is segmented into APAC, Europe, North America, Latin America, and MEA. APAC dominated the third largest market share in 2017, growing at a CAGR of more than 6% during the forecast period. The rapid urbanization, improving quality of life, and increasing per capita disposable income are some of the factors attributing to the growth of the APAC region in the global market. China, Japan, South Korea, and India are the largest revenue generators in the APAC market. The economic development is resulting in a rising number of air routes and air travelers in APAC, propelling the growth of the cargo handling services market. The privatization of airports in Japan will create lucrative opportunities in the leading vendors operating in the APAC region. South Korea is developing its aviation industry, and the increasing number of passengers and freight traveling will augment the demand for cargo handlers, ramp handlers, and baggage handlers in the APAC market. Moreover, the government and aviation ministry in India proposing several effective policies will augment the development of the APAC cargo handling services market during the forecast period. The airline type segment in the cargo handling services market is classified as passenger airlines, cargo airlines, and chartered airlines. Cargo airlines segment occupied the second largest market share in 2017, growing at a CAGR of around 6% during the forecast period. Cargo handling services in the global market include unloading of cargo, cleaning, fueling, and loading new cargo to ready the airplane for its next flight. 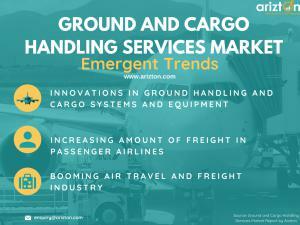 The increasing focus on maintaining punctuality of the airline flight schedule and improving the customer experience are the major factors augmenting the development of the cargo handling services market. The growing penetration of online retail and e-commerce websites is fueling the demand in the air freight industry, thereby boosting revenues in the global market. The growing demand between Europe and APAC is boosting the air fright trade for both the regions and create lucrative opportunities for leading vendors operating in the global market. APAC is the largest export center for air freight and expected to grow in the cargo handling services market over the next few years. The cargo handling services market by service type is divided into ground handling and cargo handling. Cargo services dominated more than 1/3rd of the market share in 2017, growing at a CAGR of over 5% during the forecast period. The growing demand for delivering perishables and temperature controlled items at a stipulated time is augmenting the growth of this segment in the global market. The cargo services include handling of freight, movement of freight on the apron, handling of mail and documents, trucking services, warehousing on cargo airports, loading and unloading of cargo, road feeding, and GSSA services. Various companies are outsourcing their GSSA services to third-party vendors to reduce costs and boost revenues in the cargo handling services market. The increasing demand for air freight increases business opportunities for vendors providing cargo handling services to airlines. Freight handling and logistics are the two main services offered by players in the cargo handling services market. The other prominent players in the cargo handling services market include Bird Group, Celebi Aviation, SATS, Aviapartner, BBA Aviation, DHL, Fraport, Glamco Aviation, Primeflight Aviation, and Havaş. The complete overview of the latest market research report on cargo handling services market by Arizton is now available.